In reorganizing my studio the other day I came across a few extras of our wedding invitations stowed away in a box of random cards and paper. Now, more than 3 years into our marriage, I can admit there are a few things I might do differently if given another chance to throw a matrimonial party (like maybe skip having 150 napkins custom made, or hire someone to set up all the tables instead of doing it ourselves that morning, for example?) That being said, there are some decisions we made that still make me really happy, one of them being the design of our wedding invitations. I had the good fortune of starting a new job at Sugar Paper just a couple of months before our wedding, which meant I basically won the lottery in terms of invitation resources. Not only did I have enough time to learn a bit about typesetting, but once the design was complete our invitations were printed on vintage letterpresses by some of the most talented pressmen in the business. As our ceremony took place on the beach in Laguna and the reception at a salty sailor yacht club in Dana Point, we decided we wanted the style of our wedding to be a mash-up of vintage nautical elements and Albertus Seba's Cabinet of Curiosities (think stacks of ocean-themed books from the early 20th century, brass compasses and magnifying glasses, and bell jars covering succulents and gardenias with partially hidden keys and snake vertebrae.) 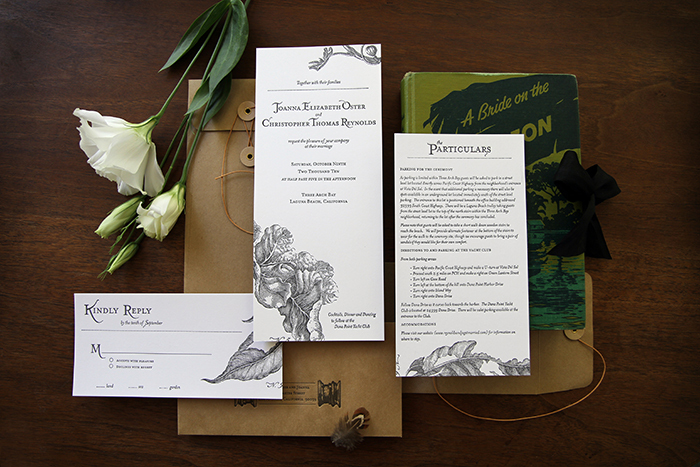 We used details from antique botanical drawings on the invitations themselves and sourced recycled-content envelopes with string and button closures. The size we chose - #10 - was a bit unorthodox for wedding invitations, but from the beginning we were both drawn to it. It sort of felt like we were sending out really fancy library cards to everybody, and with all the books used in our reception centerpieces it made sense in the end! Looking back through all the photos from that day, I love that our invitations were truly a sneak peek at what the rest of our wedding would look like.